Following a Constitutional Council decision to uphold fines against three former opposition party officials over an election boycott campaign last month, a council official said the men could potentially face prison and further fines if they did not accept the decision. 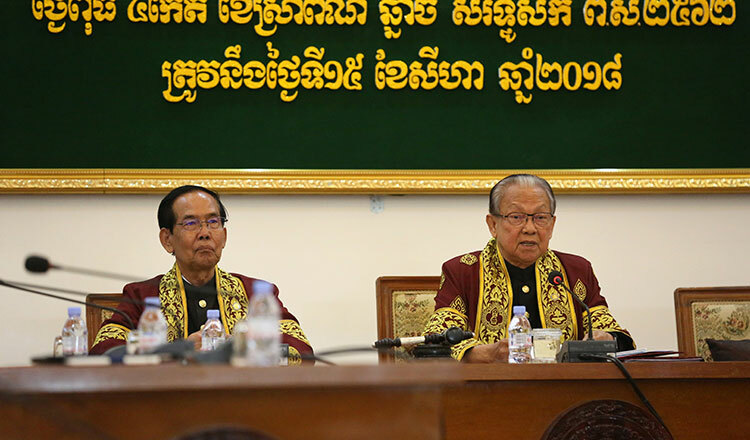 Constitutional Council president Im Chhun Lim yesterday conducted an appeal hearing for former opposition officials Chea Chiv, Kruy Kimsaing and Thong Saroeun, who were seeking to have their fines dropped. Prom Vichet Akara, a spokesman for the council, said that the chamber was not convinced by the defendants’ lawyer or the evidence presented during the hearing. “Based on facts and the legality of it all, the three men are absolutely guilty of violating election laws and the council believes that there was enough evidence to fine them,” Mr Vichet Akara said. Mr Vichet Akara said that if the men failed to comply with the decision, they could face imprisonment for up to one year and be fined an additional $150. Mr Chiv was fined $2,500, while Mr Kimsaing and Mr Saroeun have been ordered to pay fines of $1,250 following their failed appeal to the National Election Committee last week. Sam Sokong, a lawyer representing the defendants, said that he was dissatisfied with the verdict and noted his clients could not afford to pay the fines. After posting photos of themselves with clean fingers on Facebook, the former officials were hit with a complaint from a ruling CPP commune chief for obstructing the election by calling for a boycott. After the hearing, Mr Chiv argued that the council and NEC were beholden to the ruling CPP and issued the verdicts to target former opposition officials. Mr Sokong noted that only the King can pardon them now, an option discussed with his clients. The NEC last week decided to uphold charges of five former opposition officials in Battambang and five more in Kampot for participating in the boycott campaign. The NEC eliminated fines for seven out of ten former officials, prompting former Battambang provincial CNRP head Mr Chiv, and Mr Kimsaing and Mr Saroeun, to file an appeal with the Constitutional Council.